Arriving to Auckland on United? Why not book your airport transfer with us? 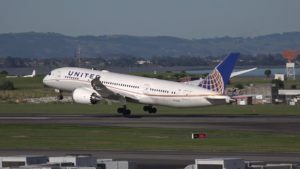 Non-stop flights between San Francisco and the “City of Sails”, Auckland are now being offered by United Airlines. United plan to use Boeing 787-8 Dreamliner on the route, making it more comfortable flying than ever. Frequent flyers will welcome this new addition to Auckland airport’s busy schedule. The service will be offered three times a week, and overall flying time will be approximately 13 hours, The new service is expected to generate a whopping $190 million per year for the New Zealand economy. Auckland Airport Limos can take care of all you transfer requirements, upon arrival into Auckland airport. Whether you require an executive limo, cheap cab, corporate cab or a an airport shuttle service, Cobb & Co has it all. We have been in the business of passenger transport since 1861 and really know how to take care of our passengers’ requirements. Give us a call and book your airport transfer today on 0800 777 076 or email info@cobbandco.com. You can go to our bookings page to make an instant online booking. Its easy. You can book and pay online. We will contact you to confirm all the details.